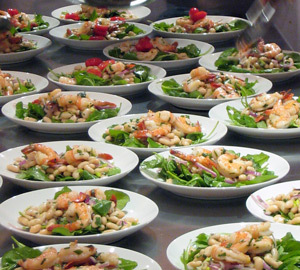 Mark Your Calendars: Tuscan Seafood Cooking Class on January 30 in NYC! Class starts at 12 pm, and includes a full Italian meal; the cost is just $110 per person. Reserve here before class sells out. The trick to tender shrimp is not to overcook them: as soon as they turn pink and curl, and are no longer translucent, they are done and should be removed from the heat. Make the shrimp: Bring the wine, and water to a boil with the onion and bay leaf in a 2-quart pot over medium heat. Cook 15 minutes. Add the shrimp and cook just until they turn opaque, about 1 minute. Drain and toss while still warm with the lemon juice, lemon zest, olive oil, chives, parsley, oregano, salt, pepper, and garlic. Make the beans: Toss all the ingredients in a large bowl. Sea bream is one of Italy's great fish: sweet, moist, not at all fishy, it cooks up beautifully on the grill. 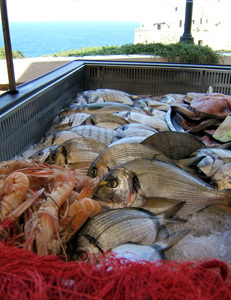 If you can't find it at your local fish market, substitute Mediterranean sea bass (Branzino) or red snapper instead. Cooking chunks of fresh lemon on a hot grill caramelizes them, bringing out their sweetness more than their acidity. You can try limes or oranges instead for a different flavor. To offer guests at a barbecue an original palate cleanser, simply thread chunks of lemons, limes, and oranges on skewers and grill until caramelized, then pass the skewers around like lollipops between courses. If using wooden skewers, soak them in water to cover for 30 minutes; drain. Place the sea bream fillets with the side that was touching the skin facing up. Sprinkle with the garlic, shallots, and oregano. Roll each fillet into a tight bundle. Thread the bundles on the wooden skewers, alternating them with the lemon slices and bay leaves; keep them rather close together so the bundles don't unravel. Drizzle the bundles with the olive oil and season with the salt. Swordfish or tuna are good alternatives if you can't get your hands on sushi-grade salmon. Arrange the salmon in a single layer in a shallow but wide container. Sprinkle with 1 teaspoon of the salt and the lemon juice; refrigerate 30 minutes. To serve, drain the salmon of its marinade; the salmon will have changed color and become somewhat firm thanks to the salt and lemon juice. Toss the mesclun with the remaining ¼ teaspoon of salt and the olive oil. Mound on 6 plates. Swordfish, monkfish, or tuna work well if mahi-mahi is unavailable. Make the mahi-mahi: Preheat the oven to 425 degrees. 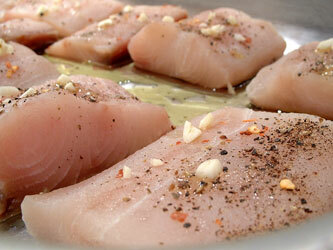 Place the mahi-mahi in a roasting pan; season it on all sides with the salt, pepper, chili, and garlic. Drizzle with the olive oil. Bake in the preheated oven for 15 minutes, or until firm to the touch and the juices run clear when pierced. Transfer it to a deep serving platter. Sprinkle with the lemon juice. Meanwhile, make the salsa: Combine all the ingredients in a bowl. Red snapper works well if branzino is unavailable. Preheat the oven to 400 degrees (preferably set on convection). Place the mussels and cockles in a bowl; cover with cool water and add 1 tablespoon of the salt. Let soak for 30 minutes, then drain and rinse to get rid of any sand. Cook the mussels and cockles over high heat in a small pan, covered, for 5 minutes, or until they open. Combine with all the remaining ingredients except the sea bass in a bowl. Cool to room temperature. Cut sturdy aluminum foil into four 14-inch squares. Place the aluminum squares shiny side up on a counter. Place 1 sea bass fillet on the left side of each square. Top evenly with the seafood-tomato mixture. 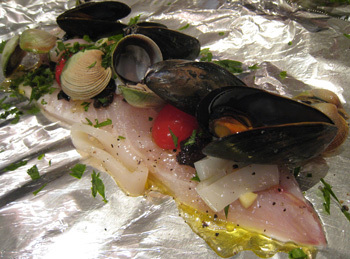 Fold the aluminum foil in half to enclose the sea bass fillets. Fold the short sides of the aluminum foil over first, then seal the long side of the aluminum foil tightly as well, rolling the foil over itself a few times so that the cooking juices cannot run out. Place the aluminum foil packets on a baking sheet in a single layer, seam side up, and roast in the preheated oven for 15 minutes, or until the sea bass feels firm to the touch. 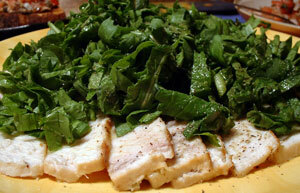 This impressive salad is a favorite in Liguria. It was first made by fishermen's wives using boiled vegetables and dry biscuits when their husbands went out to sea for days at a time; eventually, seafood and fish were added, and the recipe became far more elaborate and sumptuous. Make the fish: Bring 6 quarts of water to a boil with the onion, carrot, celery and bay leaves in a shallow and wide 12-quart pot. Cook over medium heat 15 minutes. Add the sea bream and cook 5 minutes. Add the monkfish and cook 5 minutes. Add the shrimp and cook 1 minute, or until all the fish and seafood is cooked. 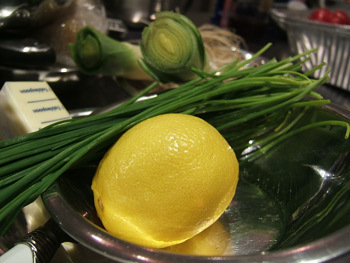 Remove all the fish and seafood with a slotted spoon to a tray (reserve the broth for soup or risotto). Cool to room temperature. Fillet, skin and bone the sea bream and cut into 2-inch pieces. Cut the monkfish into 2-inch pieces. 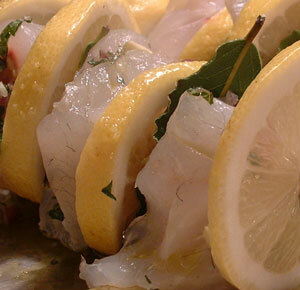 Toss the sea bream, monkfish, and shrimp with the olive oil, lemon juice, salt and pepper. Set aside. Make the salad: Bring 4 quarts of water to a boil in a 6-quart pot. Working in batches, cook the baby vegetables separately in the boiling water 10 minutes, or until tender; remove with a slotted spoon to a bowl of ice water. Toss with the olive oil, vinegar, salt, and pepper in a bowl. Set aside. 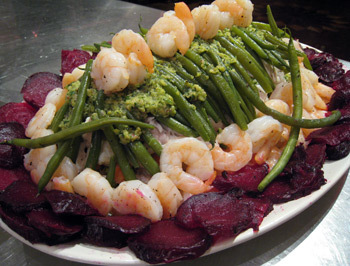 Layer the cooked vegetables, fish, and seafood on a large serving platter, making 6 layers in all. Make the salsa verde: Place the eggs in a 1-quart pot; cover with water; bring to a boil over medium heat and cook 12 minutes. Drain, cool, shell and scoop out the yolks (reserve the whites for other dishes). Place in a food processor. Soak the bread with the vinegar for 5 minutes, then squeeze dry and crumble into the food processor. Add the parsley, pine nuts, capers, anchovies, olives, and garlic and process to a paste. Add the olive oil in a thin stream with the motor running until emulsified; season with the salt and pepper and transfer to a bowl. Smoked tuna is equally delicious in this sumptuous yet lean appetizer. Arrange the smoked salmon in a single layer on a tray. Sprinkle with the lemon juice and set aside for 10 minutes, then roll into pretty rosettes. Toss the arugula with the salt and olive oil. Arrange on a platter. 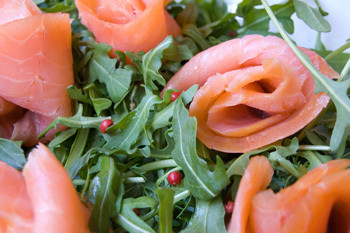 Top the arugula with the smoked salmon rosettes. Sprinkle the smoked salmon with the pink peppercorns and chives. If you like, serve the soup over fresh egg tagliatelle instead of grilled garlic-rubbed bread; you'll need 1/2 pound of fresh pasta for this recipe. 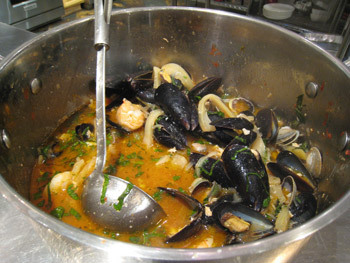 Make the seafood soup: Soak the cockles and mussels in cool water to cover with 2 tablespoons of the salt for 30 minutes; rinse thoroughly and drain. Set aside. Heat 2 tablespoons of the olive oil in a wide pot over medium heat. Add the fennel, onion, shallots, garlic, parsley, bay leaf, chili flakes, the remaining teaspoon of salt, and the pepper, and cook 10 minutes, or until soft. Add the wine and cook until reduced by half, about 5 minutes. Add the tomato paste, tomatoes, and water, and bring to a boil. Simmer, covered, for 30 minutes. Add the cockles and mussels to the soup, cover again, and cook until they open; discard any unopened mussels and cockles. Add the shrimp and monkfish to the soup and cook until cooked through, about 5 more minutes. Meanwhile, make the garlic bread: Heat a nonstick grill pan over a high flame for 5 minutes. Grill the bread until browned on both sides but still soft inside, about 3 minutes per side, turning once. Rub the warm grilled bread with the garlic and drizzle with the olive oil. Sprinkle with salt and place in each of 6 bowls. I hate dry salmon. And more often than not, baked salmon is just that: dry, flaky, and uninteresting. And while salmon (like other fish that tend to dry out in the oven) can be baked in parchment paper or foil to ensure it emerges moist rather than dry, I thought there had to be a foolproof way to bake salmon other than wrapped in parchment paper or foil... and so after a few tries, I hit upon a technique that delivers consistently moist, succulent results. I decided that slow, gentle heat would fare better with salmon than high heat; 250 degrees seemed to do the trick. 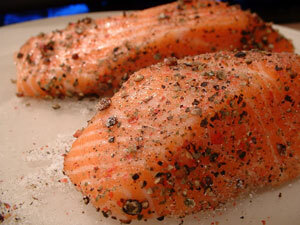 I selected a few seasonings that pair well with salmon, turned on the oven, and enjoyed the best baked salmon ever. 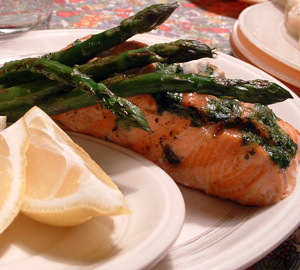 If you have the time, roast a bunch of asparagus to serve with the salmon. Make the salmon: Preheat the oven to 250 degrees. Rinse the salmon and blot it dry. Brush an 8-inch square baking dish (preferably glass) with the olive oil. Scatter 1/2 teaspoon of the coarse sea salt over the bottom of the baking dish. Place the salmon, skin side down, in the baking dish over the salt. Season the salmon with the remaining 1/2 teaspoon of salt. Bake the salmon 30 minutes, or until cooked all the way through; it will no longer be translucent. Meanwhile, make the sauce: Place all the ingredients in a blender and puree until smooth. Adjust the seasoning and refrigerate until needed. 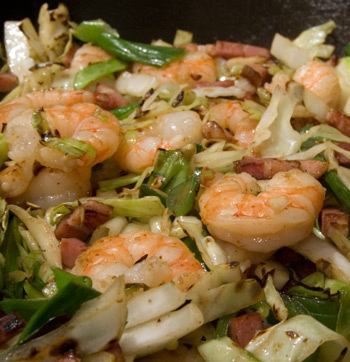 Easy enough to make when time is short, this main course offers beautifully contrasting flavors: sweet shrimp, smoky cabbage, fragrant scallions, and a haunting note of chili and garlic. Heat the olive oil in a deep, wide skillet over a high flame. Add the bacon and saute 3 minutes, or until lightly browned all over. Add the cabbage and cook another 5 minutes, stirring once in a while (do not stir too often or the cabbage won't have a chance to stick and brown in spots; this caramelization is key to good flavor). Stir in the scallions and shrimp, and saute another minute, or just until the scallions soften and the shrimp turns mostly pink. Add the garlic and jalapeno, season with the salt and pepper, and saute 1 more minute, or until the shrimp are fully cooked; there should be no grey spots left, and the shrimp should be fully opaque rather than translucent. You can make your own lasagna sheets for the fritters, or you can use store-bough wonton wrappers to save time. The wonton wrappers may not be Italian, but they work very well--they puff and become deliciously crispy after a quick bath in hot olive oil. For a step-by-step recipe for homemade lasagna sheets, click here; you will need one-quarter of the lasagna recipe. Make the fennel slaw: Toss all the ingredients together in a bowl; set aside up to 30 minutes at room temperature. When you are ready to serve, heat the olive oil in a deep and narrow pan over a medium-high flame until it registers 325 degrees on a deep-frying thermometer. Deep-fry the shrimp wontons in 3 batches, turning as needed; the dough should be crisp and the shrimp firm and pink and cooked all the way through, about 2 minutes per batch. Using a slotted spoon, remove to a tray lined with paper towels and blot dry. Be sure to allow at least 24 hours for soaking the salt cod before cooking. 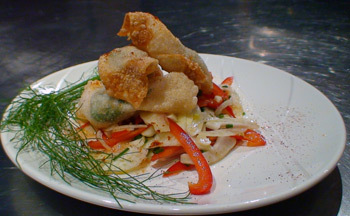 You will find salt cod (baccala') at fish markets catering to a Mediterranean clientele. Soak the salt cod in cool water to cover for 24 to 48 hours, changing the water every 8 hours. (The salt cod does not need to be refrigerated.) Drain; discard any bones and trim away any skin from the salt cod. Bring 2 quarts of water to a boil. Add the salt cod and cook 2 minutes, then drain and cool to room temperature. Blot dry and flake into large chunks with your hands. Place on a serving platter. Meanwhile, preheat the broiler. Line a roasting pan with aluminum foil. Arrange the peppers, cut sides down, on the foil-lined pan. Broil for 15 minutes, or until blistered and black all over. Remove and wrap in the foil until the peppers reach room temperature; they will steam inside the foil and the skins will be very easy to peel away. Unwrap the peppers and peel the skin away. 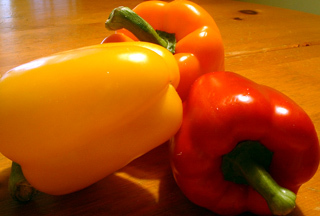 Cut the roasted pepper flesh into long, thin strips. You can make your own grilled focaccia for this delectable brunch dish, or you can use store-bought focaccia or crostini if time is short. 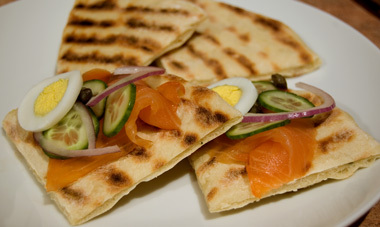 For a step-by-step recipe for grilled focaccia, click here. Place the eggs in a small pot and cover with cool water; the eggs should be submerged in the water. Bring the water to a boil over a medium flame. Cover the pot and remove from the heat. Let stand, untouched, for 13 minutes. Drain the eggs and cool under running water, then shell and slice thinly with an egg slicer. For the most tender texture, look for the smallest squid possible. Cuttlefish can be cooked the same way, but they are generally chewier than squid. Make the tomato sauce: Heat the olive oil in 1-quart saucepan over a medium flame. Add the shallot and basil and cook until the shallot softens, about 10 minutes. Add the tomatoes, ½ cup of water, the salt and pepper, and cover; bring to a gentle boil, then lower the heat to medium-low, Cook 30 minutes, stirring often, reducing the heat as needed to prevent scorching. Meanwhile, make the squid: In a bowl, combine the bread crumbs, egg, Pecorino, milk, garlic, parsley, capers, and pepper. Using a tiny spoon, stuff the bread crumb mixture into the squid. Don't overstuff the squid or they may burst as they braise. There may be leftover stuffing. Close the opening of each squid with a toothpick, spearing it diagonally. 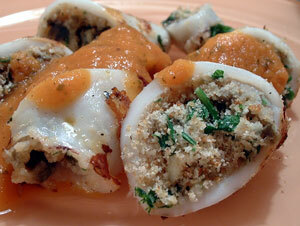 Gently lower the stuffed squid into the simmering tomato sauce. Cover the pot and cook the squid until it is tender, about 45 minutes. The trick to truly tender calamari is simple: don't overcook it! As soon as the calamari turns opaque and firms up, it's ready to pull off the grill. Select small calamari if possible for the tenderest texture. If you don't have tarragon and chives handy, substitute basil and Italian parsley. 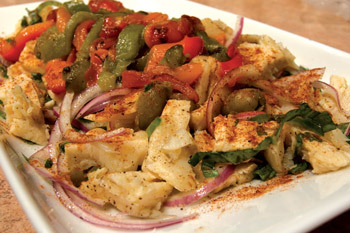 Make the calamari: Preheat an outdoor grill or grill pan until blazing hot. Blot calamari tubes and tentacles dry with paper towels. Toss calamari tubes and tentacles with olive oil, salt, and pepper in a large bowl. Place calamari tubes and tentacles on grill in a single layer-do not crowd the grill or stack the calamari; if necessary, work in batches. Using long tongs, turn calamari tubes and tentacles when bottom side browns lightly, after about 1 minute. Cook until other side is also lightly browned. Calamari should be firm and opaque. Do not overcook or calamari will be tough and rubbery. Remove to a cutting board with a clean set of tongs. Cut tubes into ¼-inch-thick rings. Scampi are a small European lobster; they are also called langoustines or langostinos. If you can't find them at your local seafood market, substitute jumbo shrimp. Combine the celery, carrot, onion, peppercorns, thyme, bay leaf, garlic, and wine in a 4-quart pasta pot lined with a pasta insert. Add 3 quarts of water. Bring to a boil over medium heat and cook, uncovered, for 15 minutes. Strain and return to the same pot, leaving the pasta insert in the pot. Return to a boil over medium-high heat. 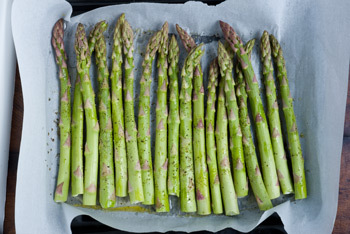 Drop in the asparagus and cook until crisp-tender, about 3 minutes; remove to a bowl of ice water to set the color and stop the cooking, drain, then place in a serving bowl. Add the scampi to the pot of boiling water. Cook 2 minutes, or until they curl and become pink. You can substitute chunks of chicken breast for the shrimp in these succulent skewers for a change of pace. Make the infused olive oil: Combine the basil, thyme, chives, tarragon, olive oil, chili, salt, and garlic in a blender until smooth. Toss the shrimp and red pepper with the infused olive oil in a shallow container. Skewer 1 shrimp and 1 cube of bell pepper on each of thirty-six 6-inch skewers. To create a more sophisticated main course, you can toss a few shrimp in the shell into the roasting pan when the snapper is halfway through cooking. The snapper tastes best after it marinates for a day or two in the refrigerator, so it's a great make-ahead dish. Place the red snapper in a roasting pan; season it on all sides with 1/2 teaspoon of the salt, 1/8 teaspoon of the pepper, the chili, and the minced garlic. Drizzle with 1 tablespoon of the olive oil. Add the rosemary, thyme, and sage, and set aside 30 minutes at room temperature. Roast in the preheated oven for 20 minutes, or until the red snapper is firm to the touch and the juices run clear when it is pierced. This dish has all the makings of a classic: it takes minutes in the kitchen but looks like a masterpiece; it uses few ingredients; and it tastes like absolute heaven. Yet as easy as this recipe is, there are three things to keep in mind if you want the results to be memorable: Saute the shrimp over very high heat so they cook quickly and remain tender; don't crowd the shrimp in the pan--be sure to cook them in a single layer, or cook them in several batches if needed; and don't bother making this dish with dried mint, for it has none of the fragrance of fresh. Heat the olive oil in a 14-inch skillet over a high flame (the high flame is essential: you want to flash-cook the shrimp, not steam them in the skillet!). Add the mint leaves, bay leaves, garlic, and chili flakes when the oil is almost smoking. 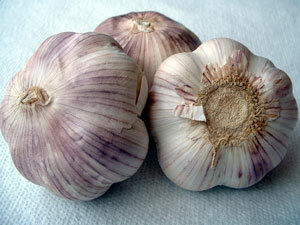 Cook 30 seconds without stirring; if the garlic begins to burn, you've cooked the herbs a few seconds too long. 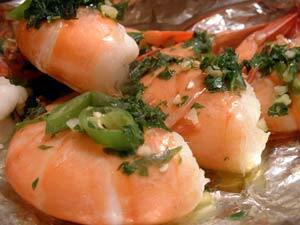 Add the shrimp in a single layer; cook 30 seconds, or until just starting to turn pink around the edges. Season with salt; turn and season the other side with salt. Be sure to ask your fishmonger to remove the thin, transparent purple membrane that covers the monkfish: if the membrane is left on, it contracts as the fish cooks, making the fish tough and stringy. Make the herbed oil: Combine all the ingredients in a food processor until smooth. Make the monkfish: Preheat the oven to 450°. 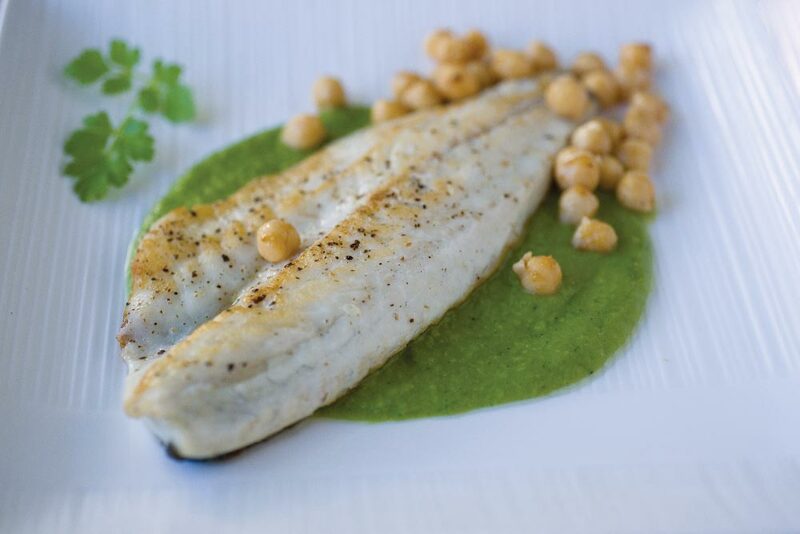 Toss the monkfish with the herbed oil in a 12-inch roasting pan, coating all sides. Literally translated, fritto misto means "mixed fry." In the coastal areas of Italy, the "mix" includes tiny fish with the heads and tails still on, squid cut into rings, scampi, and more. The fish and shellfish are typically rinsed, blotted dry, dipped into flour, and fried in hot extra-virgin olive oil, to be served with lemon wedges and sprinkled with salt right at the table. You can add slices of zucchini, eggplant, or artichokes to the mix--just be sure to fry these before the fish, or they will taste decidedly fishy. Heat the olive oil in a deep pan. When it registers 375°, dredge the fish and shellfish in the flour and shake off the excess. Deep-fry the fish and shellfish in several batches, turning once or twice, until golden all over and crisp. Try to fry similar fish and shellfish together to facilitate even cooking, as some fish and shellfish will take longer to cook through depending on their size and texture. 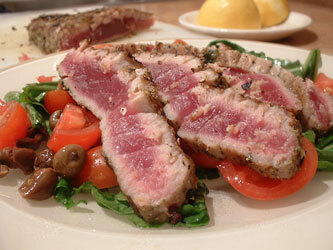 In the recipe below, tuna is rubbed with thyme and fennel seeds, then grilled and served atop a refreshing arugula salad. Meanwhile, in a large bowl, toss the arugula, onion, celery leaves, cherry tomatoes, olives, lemon juice, olive oil, salt, and pepper. Arrange on a serving platter. When you are ready to serve: Heat a 14-inch grill pan over a high flame for 5 minutes. For rare tuna, grill the tuna 3 minutes per side, turning once; for medium or well-done tuna, grill longer (Italians prefer their tuna well-done). Remove the tuna to a cutting board, cut on the diagonal into thin slices, and arrange it on the serving platter atop the salad. A combination of dried herbs and spices gives the salmon a distinctive Mediterranean taste. If you don’t like cilantro, use Italian parsley instead. In a mortar or spice grinder, combine the paprika, fennel, coriander, cumin, caraway, peppercorns, salt, and lime zest. Crush or process until coarse. 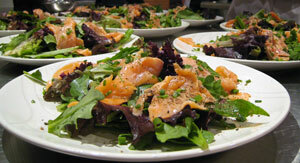 Pour onto a plate and rub the salmon in the mixture, coating all over and pressing on all sides so the mixture adheres. If smoked swordfish is unavailable, try smoked tuna instead. Arrange the smoked swordfish in a single layer on each of 4 plates.